Sometimes they seem inescapable—those vague (or not so vague) money worries that persistently clutter your mind. If you’re feeling anxious about money, you’re not alone. 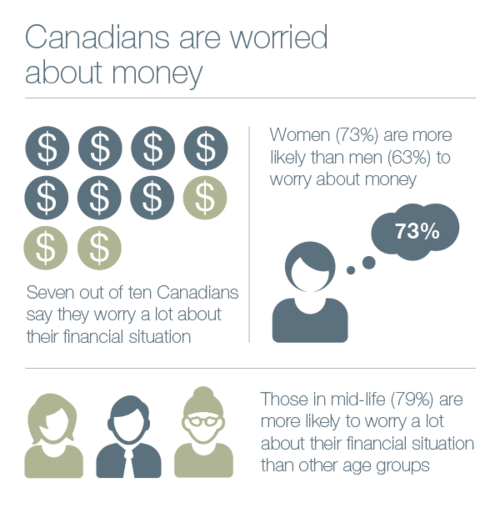 Research shows that most Canadians share that worry, with 7 out of 10 saying they worry a lot about their financial situation. Women are more likely to worry than men and those in mid-life are more likely to worry than other age groups. But there are ways to lose the anxiety and get on the path to financial well-being. Whether your goal is to get your debt under control, make ends meet with some breathing room or take that trip you’ve always dreamed of, you don’t have to go it alone. Toronto-based Certified Financial Planner® professional and financial wellness expert Frank Wiginton shares these tips to combat your worries and rediscover a calm, confident approach to your money. By taking a clear look at your finances in spite of your worries, you can feel good in knowing that you’ve overcome procrastination and are on the right track. Tackle things in small bites and it’ll get easier as you go along. Use the momentum of getting started to begin to address your concerns and ultimately eliminate them. If your car needed fixing or your roof needed to be replaced, you’d more than likely call in a pro. Getting expert help with your finances makes just as much sense. Don’t feel shy about your financial situation or think you need to be further ahead financially before you see a Financial Planner. Your Planner has seen countless situations like yours and is there to help, not judge. Think of them as your coach on the path to financial well-being. No matter what your current circumstances, a professional financial planner can help you take charge and get back in control. You’re not alone if you struggle with numbers and financial terminology, become intimidated by the subject or just zone out. Don’t be afraid to ask your Financial Planner lots of questions. A good Planner will make sure that every question is answered, that you understand what’s happening, and that you agree with what’s being recommended. Have an open discussion with your family about your financial concerns. Stress can be reduced when we stop trying to hide our situation from others. Use the opportunity to share and learn from other family members, who have more than likely been in a similar financial situation to yours. You may be surprised at the support and helpfulness of the whole family once you’re all on the same page. Review and revise your financial goals regularly, on your own and with your Planner, to be sure your day-to-day activities keep you on track to reach your short and long-term dreams. For more on easing your financial worries, read 4 ways to overcome financial planner anxiety and Is financial stress putting your health at risk? Honesty may be the cure and watch Build your money confidence.